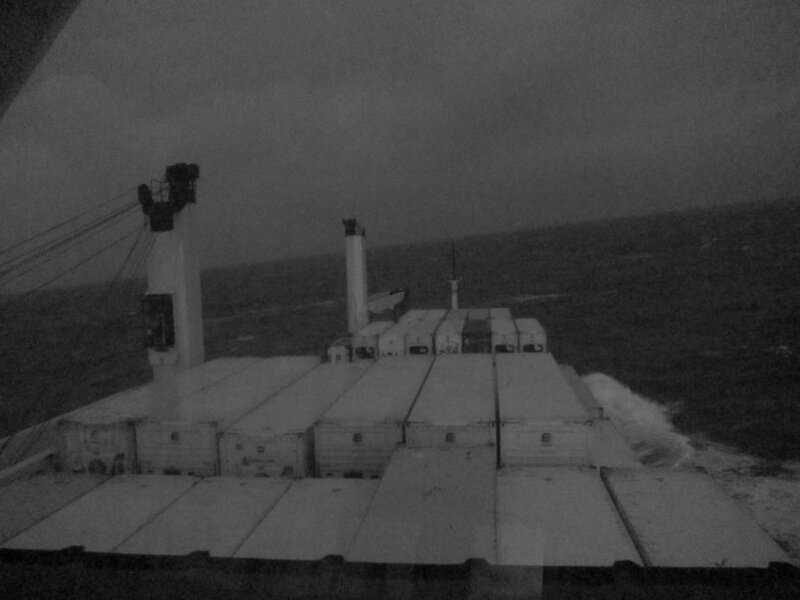 Thanks for the emails and interest in our recent North Sea/North Atlantic cargo ship adventure. We made it back safe and sound, well, just barely in Greg’s case – read on … As promised, here’s an account of our wintery jaunt through northern seas. 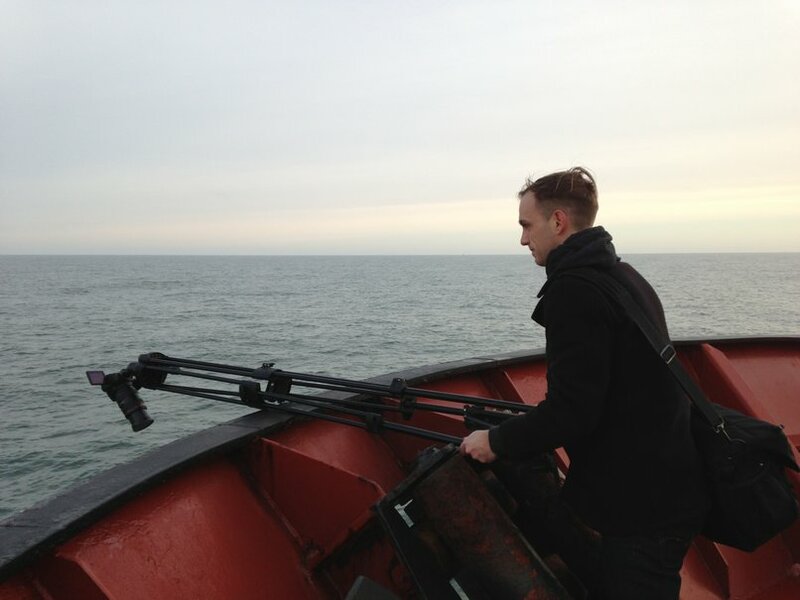 Travelling on a container ship on the Atlantic Ocean is something I’ve wanted to do for years and seeing as we wanted to film video for our nautical-themed album, My Father Was A Sailor, now was as good a time as any for this trip. 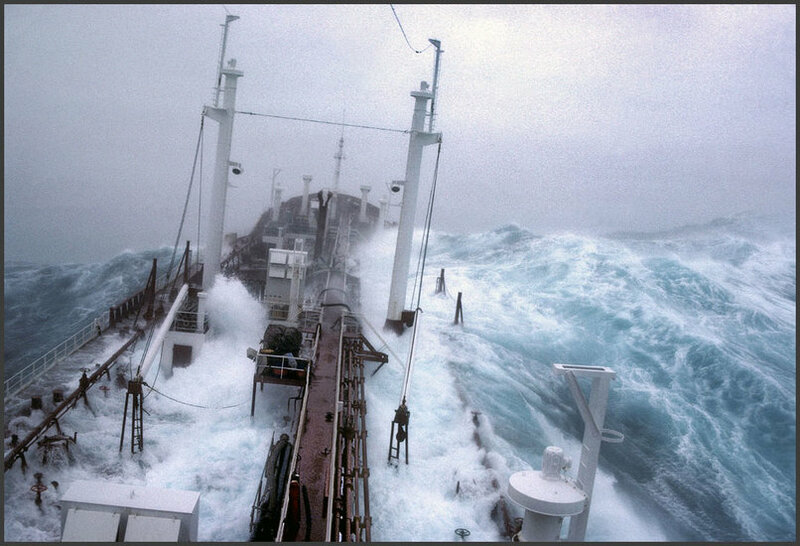 Our goal was a 3 or 4 day trip around the North Sea/North Atlantic ocean in winter, when the weather was (hopefully) at its stormiest and the seas were at their most fierce for the most dramatic footage and but also for the experience as well. It was a trip that almost never happened. 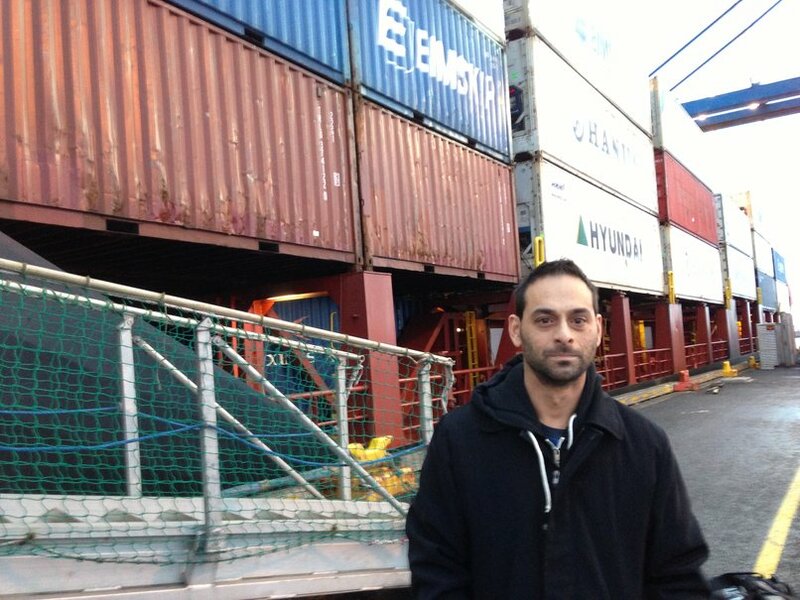 I contacted many shipping lines about travel in the North Atlantic area, but none would take passengers. I then tried travel agents that specialized in freighter ship travel and although there were available options, the routes being offered were either not in our desired area or the durations were far too long. At this point I almost gave up on the whole cargo ship idea, but decided to try one last shipping company, Iceland’s Eimskip. Expecting the same response as the other lines, I was surprised and excited when they offered us a 4 day route on their container ship Brúarfoss between Immingham, UK and Reykjavik, Iceland, which was exactly the type of route I’d been hoping for. We finalized arrangements and 2 weeks later, filmmaker Greg Gillespie and I were off to film the open ocean. 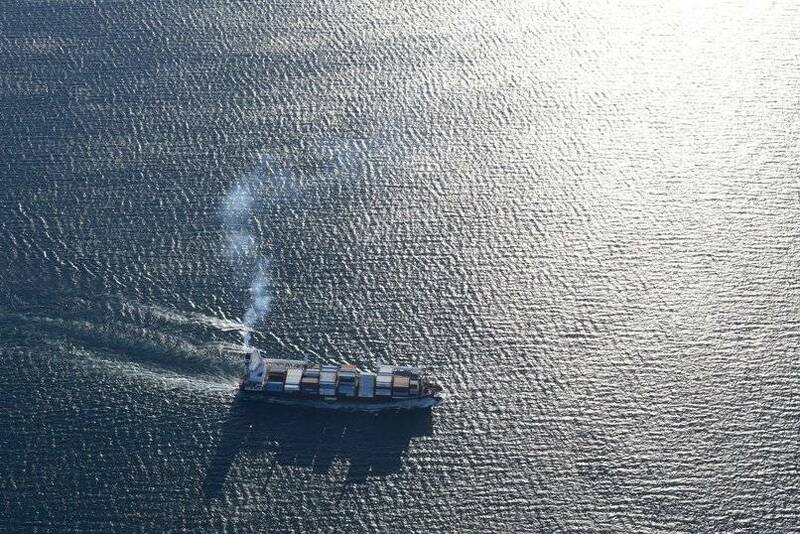 For the couple of weeks prior to our trip, I had been following the sailings of the Brúarfoss on marinetraffic.com and its arrivals and departures to and from each port were always right on schedule. 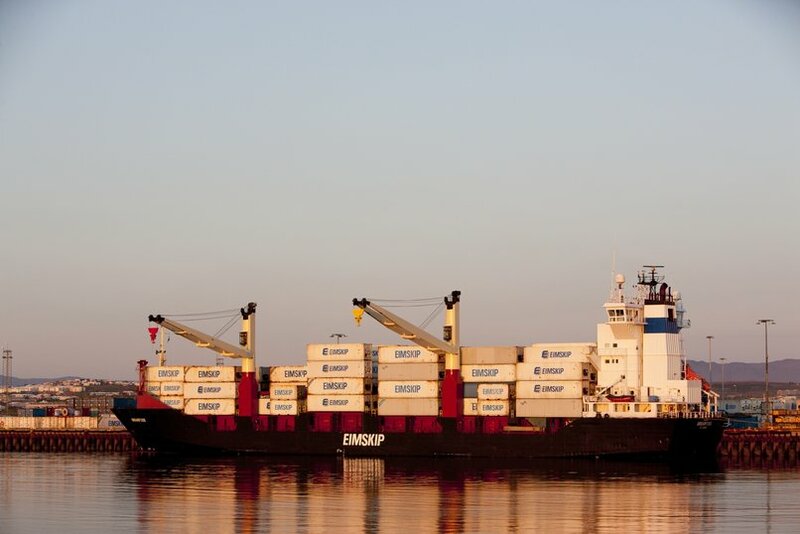 But on the day we were supposed to sail, the vessel didn’t arrive at the Immingham port from Rotterdam until late Thursday night due to poor weather, more than 12 hours behind schedule. This delay put the likelihood of me making my flight back home from Reykjavik on Monday afternoon in jeopardy but it also meant the ship leaving Friday morning instead of the originally scheduled Thursday afternoon departure. Apparently leaving port on a Friday is unlucky. And then I found out there’d also be an unlucky 13 souls aboard. Things were off to an unsettling start. Prior to boarding, I was told to watch the captain and as long as he was smiling, we’d be okay, which begged the question – was there the chance perhaps we would not be okay? I wasn’t sure if this was a joke or not and I began feeling a little unsure about all of this. It didn’t help my piece of mind that I was taking medication to prevent dizziness & nausea on the ship … but the medicine’s side effects were dizziness & nausea. How convenient. We were introduced to the captain, Gestur, a bear of a man with grey hair and mustache, and a crushing handshake. He’d been sailing longer than I’d been alive. His t-shirt, casual pants and sandals were not quite the formal naval attire I’d been expecting. He took us 5 steep and narrow flights up the metal staircase to our bunks, told us when meal times were and that was it. Expecting an introductory spiel, basic rules, or hoping at least for some sort of safety instructions, I asked him if there was anything else we needed to know. He shrugged, shook his head and told us that we could go anywhere we wanted on the ship, including the bridge and engine room. No emergency instructions given, it was all very casual and informal (albeit maybe just a little too casual and informal) but it was nice to have the run of the ship, and we definitely took full advantage of this for filming. 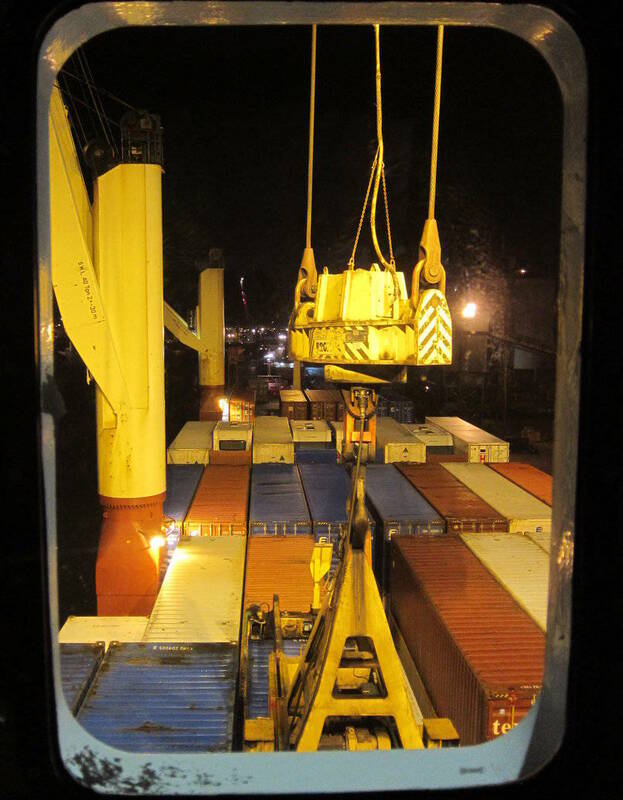 I spent a couple of hours transfixed to the cabin’s porthole window which overlooked the front of the ship, and watched the port workers load the containers (some were carrying cars, and fruits and vegetables destined for the Icelandic market) onto the vessel. When I awoke the next morning, we were out at sea. Our first day at sea was spent sailing up the eastern coast of Great Britain and conditions were fairly calm, though I had heard upon boarding the vessel that the weather forecast for the areas we’d be travelling through called for severe gales and cyclonic conditions. When I asked Gestur about the weather that lay ahead, he only laughed and said that the next day would be “rough, very rough.” Hmm. I couldn’t wait. I enjoyed spending time on the bridge chatting with the captain and officers, learning more about Iceland – their language, geography and history. I was amazed to learn that the population of Iceland is a mere 300,000. That’s not the population of Reykjavik, that’s the entire country. Wow. Apparently the captain has a famous neighbour who lives 2 doors away, who turned out to be Jónsi from Sigur Rós. I was a bit concerned that the officers seemed more intent on watching their countrymen defeat Poland in the Euro Championship handball match on TV rather than steering the ship. Greg and I seemed to be a bit of a novelty on board and a source of amusement for the all-Icelandic crew. I have no doubt they made bets as to whether or not we’d be seasick or if we’d show up at mealtime, and they were constantly asking us how we were feeling. We’d walk into the galley, all heads would turn, and they’d all smile. Nah, we were feeling fine … well, on the first day, at least. They were curious as to why we were on the ship and I explained that people thought we were crazy for travelling these northern seas in January. I was surprised that they agreed. It had been a long time since they’d had any passengers aboard and they’d never had any in winter. It made me a little uncomfortable to hear this as I’m sure there was probably good reason for it and I was half excited-half nervous to see what kind of weather the next day would bring. We passed through the narrow channel between mainland Scotland and the Orkney Islands sometime during the night. We awoke Saturday morning to completely open ocean (there was no land ahead until we’d reach the Faroe Islands almost 24 hours later), ominous skies and much rougher seas than the calmer waters of the previous day, which I think lulled us into a false sense of security. I now began to feel even more nervous and wondered if this whole trip was maybe not such a good idea after all. The rolling and heaving of the ship made me feel nauseous (why, thank you so much seasickness medication). I found that as long as I was out in the fresh air I was marginally better, so I spent a lot of time sitting outside. But when I was inside the ship I didn’t feel so well, especially when trying to navigate repeated trips up and down the endless, winding stairwell, all the while being tossed from one side to the other. Lying down and closing my eyes also provided some relief so I ended up sleeping much of the day, but less out of necessity and more in an attempt to fend off seasickness. If Greg’s heaving over the side of the ship was any indication, I’d say he fared worse than me. As a result, filming on this day was minimal. There were 3 meals each day at 08:00, 12:00 and 18:00, with coffee and cake at 15:00 served in the mess, which was like a small cafeteria. Jón was the cook and his meals were great, though due to our seasickness on this day it was difficult to manage more than a few bites. Despite feeling lousy, I never missed a meal, which won’t come as any surprise to anyone that knows me. Dinners consisted of fish, chicken or beef, often with green salad, coleslaw, and french fries, and other meals included such items as bread and cheese, bacon and eggs, pizza, egg rolls, along with fresh fruit (grapes, strawberries and pineapple), ice cream or yogurt. 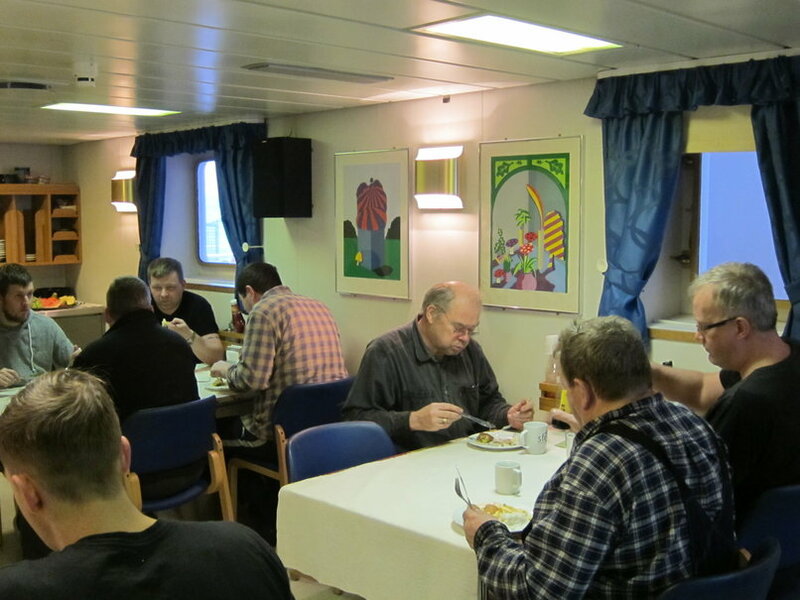 On this day I would also learn about the challenges of eating a meal on a ship in rough weather, as tables and chairs would be sliding from one side of the galley to the other, and then back again the other way. I was momentarily airborne on a couple of occasions. I felt like an octopus, simultaneously trying to grab hold of my chair, the table, utensils and my plate which darn near slid off the table several times. It was a unique and comical experience that I wish we had captured on video. It was an everyday occurrence for the crew but again, they seemed to be amused by us try to deal with stormy weather mealtime. The crew of 11 consisted of the Captain, the Chief Officer, and 2nd Officer (who each did 6 hour watches on the bridge), the Chief Engineer, 2nd Engineer, Fitter, Boatswain, Cook and 3 Ship’s Assistants. In general, the crew was fairly quiet and introverted and at meal times they ate in near-silence. I guess there’s not much new to discuss when out at sea. I found it interesting that for the most part, everyone sat in the exact same spot for every meal, so I’m glad I had the presence of mind to ask where we should sit before our first meal on the ship. It would have been embarrassing to have had to be asked to vacate the captain’s seat. As time went on, I think the crew started to warm up to us a little more and we were invited to sit with them in the evenings in the lounge, a spacious sitting room complete with leather couches and a big screen TV, and I had to remind myself that I was on a ship. It felt like I was in a living room in someone’s house – a living room that rocked back and forth, that is. The rough weather subsided by Sunday, which surprised me since we were now sailing through the heart of the North Atlantic and I would have guessed this part of the voyage would be the roughest. Though somewhat calmer seas made things more manageable (ie. less nauseous), the journey started to feel a little long and I began to feel restless. It had only been a couple of days and I wondered how sailors managed to spend months at sea without going a little loopy. Valdimar, the Chief Engineer, gave us a tour of the engine room. 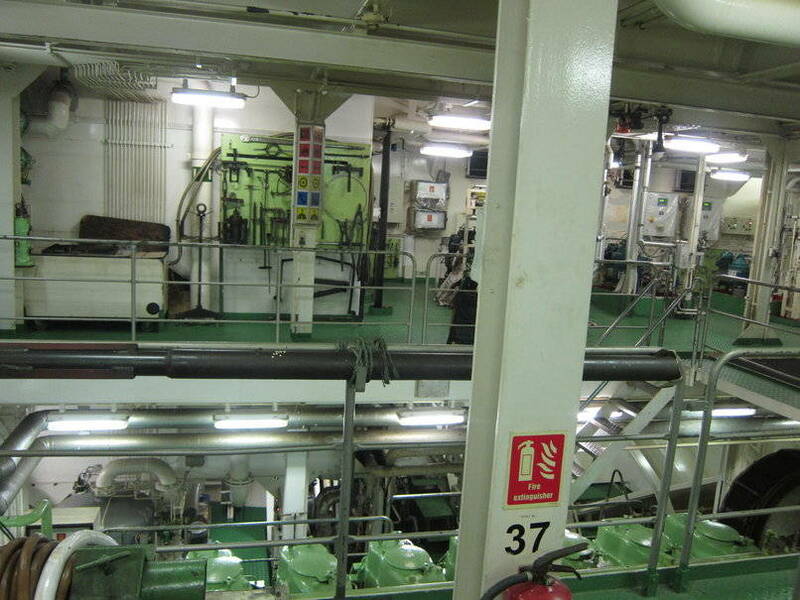 Well, it was actually more like a maze of multiple rooms in the belly of the ship, beneath the water line. As we walked through, Valdimar explained many things, but between the extreme noise of the engines, the required hearing protection, and his Icelandic accent, I couldn’t understand much of what he said and didn’t have the heart to ask him to repeat it all again later. There were also a lot of fumes in this part of the ship and I have no idea how the engineers can tolerate more than a few minutes down there, never mind days, weeks or months. Sunday was spent travelling through the more than 200 hundred miles of nothingness between the Faroe Islands (which we passed by during the early morning hours) and Iceland. Seeing other ships on the horizon and a little village on a hillside felt reassuring, but I blinked and they were gone. There was nothing there after all, just the open sea. It’s a strange feeling looking out as far as you can in any direction and seeing nothing but an expanse of ocean. I was hoping to see an island or a small trace of land somewhere, even though I knew there wasn’t any. I saw a grand total of zero vessels of any kind the entire voyage. You definitely feel very alone and isolated out in the desolate, grey North Atlantic. I wondered what would happen in an emergency. Ómar, one of the ship’s assistants, told me about his role on the ship and one of his tasks was MOB, which as it turned out, stood for Man Overboard. I couldn’t help but think that if you fell overboard and no one saw it happen, that would be the end, your chance of survival would be precisely zero. I felt somewhat comforted by the fact that there were many seabirds everywhere and I wondered how they survived so far out to sea, but their presence was deceivingly reassuring – after all, what’s a bird going to do in an emergency? 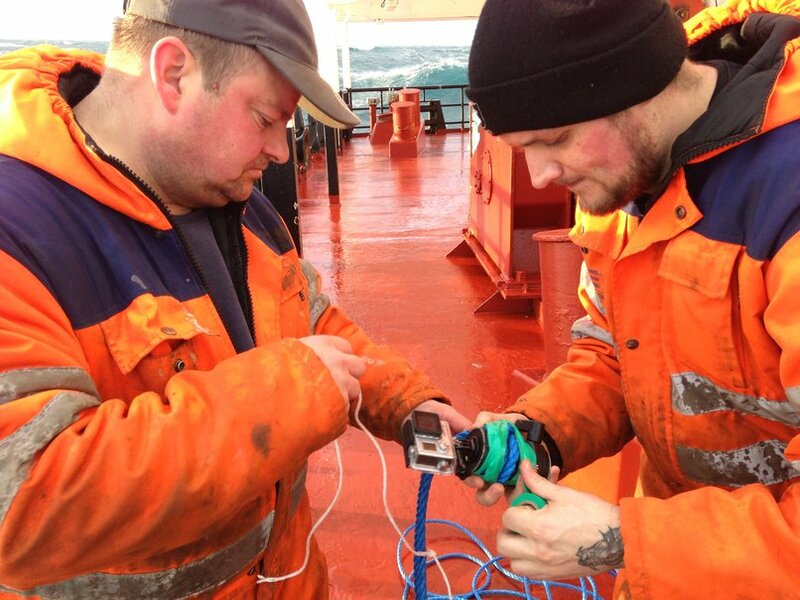 Even though I was constantly reminding Greg to be safe filming aboard the ship and not to take any risks, he almost became an aforementioned MOB (Man Overboard). He was alone at the bow, where none of the crew ever ventured and he was not visible from anywhere else on the ship. 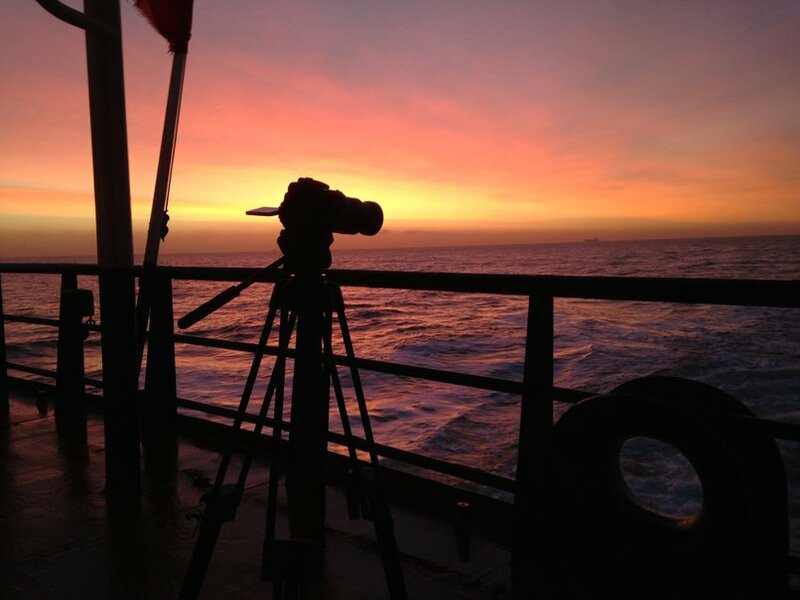 He reached precariously over the front of the ship and extended his tripod and camera as far as he could into the water for an underwater shot, and the force of the ocean nearly pulled him in. Had he fallen overboard, no one would have known. When I’ve looked at maps and seen Iceland way up north, isolated and separated from the rest of the world and surrounded by nothing but ocean, I’d think that living there must feel a bit like being on another planet. I awoke at 06:00 Monday morning, looked out the cabin window and was excited to see the lights of this other planet. I was also quite relieved to see land and civilization. 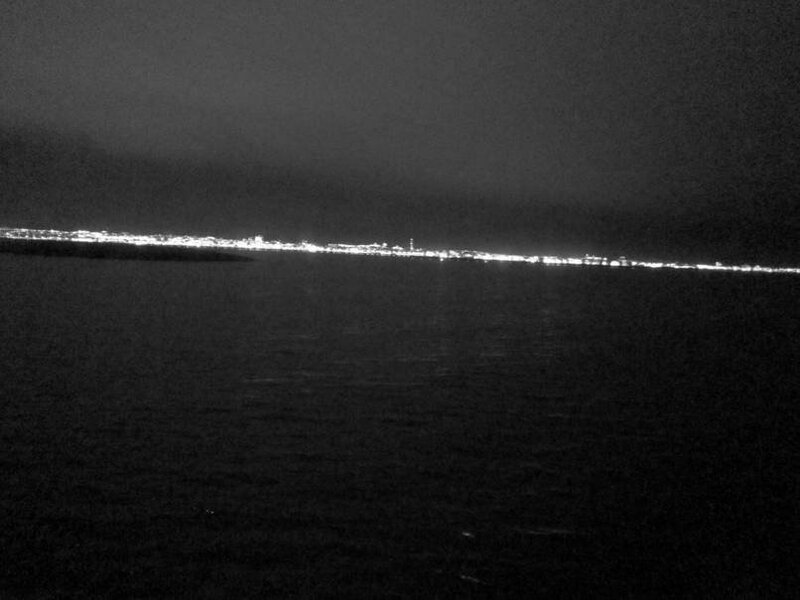 I bounded out of my bunk and hurried up to the bridge to see the Icelandic coast and the lights of many boats out on the water. We arrived in Reykjavik around 10:00, with only enough time to clear customs, stop into the office of the shipping line to thank Ingvar for facilitating our travel on their vessel and see an hour’s worth of Reykjavik before making my flight back to North America. All in all, the weather was pretty reasonable for the duration of our trip. It wasn’t overly cold, there was no fog, in fact, perfectly clear visibility the whole way, and little or no rain. On disembarking, I was told by one of the crew that this particular voyage was easy and it often gets much rougher. The expected cyclones never developed and although it would have made for spectacular footage, in many ways I’m thankful they didn’t. If the rough weather on Saturday made us feel ill, I’m sure cyclones would have been damn-near unbearable. I definitely have a new appreciation for those who earn their livelihood out on the ocean. Thanks very much to Ingvar and Jóhann from Eimskip Iceland, John from Eimskip UK, Gestur, the master of the Brúarfoss, and the rest of the crew: Ólafur, Guðmundur J., Valdimar, Björgvin, Jón, Reynir, Jökull, Guðmundur H., Ómar, and Rögnvaldur.